Bibliography: For the set: George Duplessis (Paris, 1859), p. 107, nos. 1148–1160; André Blum 670–682; N. Villa (Paris, 1967), p. 18 and plate 39. 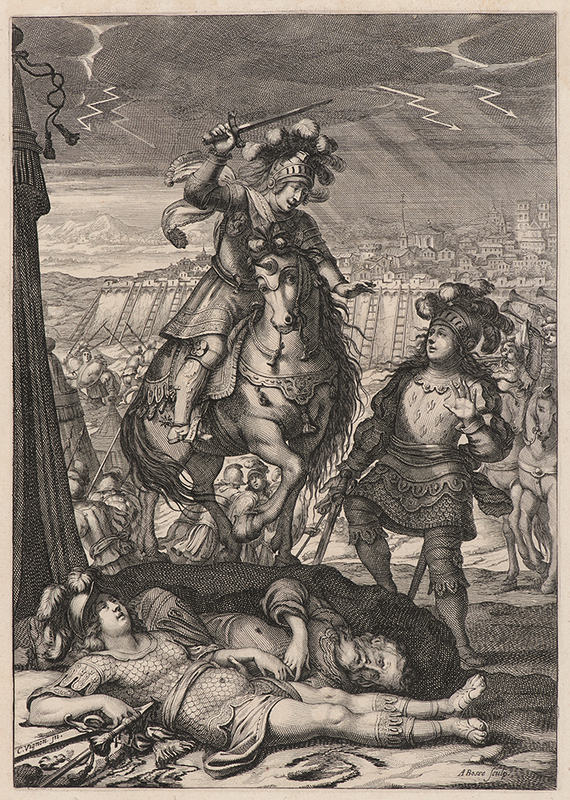 Joan of Arc Rescues the King; Paris in the Background, . From Joan of Arc, or France Liberated (La Pucelle ou La France delivrée). Engraving on laid paper. Plate: 260 x 182 mm (10.2 x 7.2 in.). Sheet: 318 x 216 mm (12.5 x 8.5 in.). DAC accession number 1979.18.8.13. Friends of the Davison Art Center funds, 1979. Open Access Image from the Davison Art Center, Wesleyan University (photo: M. Johnston). http://dac-collection.wesleyan.edu/obj2879 is a persistent link to this page with no user-session information.